OL4 - The Lake District, NW Area. 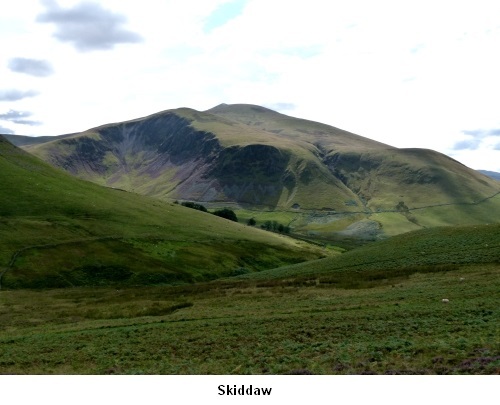 Introduction: For many people, the northern extremity of the Lake District stops at Skiddaw. This is a pity because the northern hinterland of “The Lakes” provides some very pleasant walks. 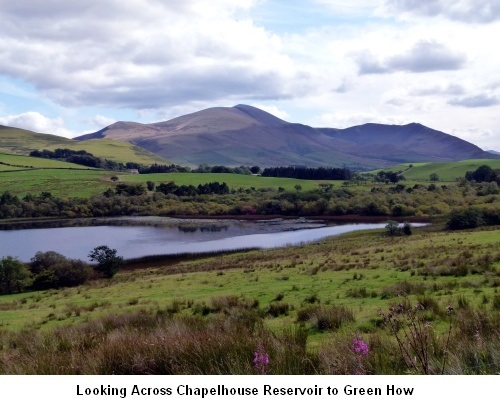 This really easy walk provides some great views including the Solway Firth and the Scottish hills beyond and a view of Skiddaw which many visitors to “The Lakes” never see. 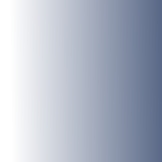 There is an ancient extensive earthwork to examine and an unusual statue. This is a little walked area compared to the main Lake District areas and you may well meet no-one else. There is some road walking but only on very quiet roads where you will meet virtually no traffic. Also, some of the footpaths do not appear as public footpaths on the OS map but this is Open Access land and I can assure you the tracks are easy to follow. The walk starts at the small car park at Over Water. 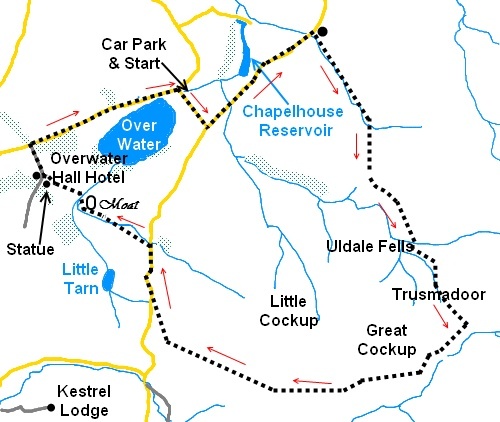 To get there, turn north east off the A591 at the Castle Inn Hotel at Kilnhill signposted for Uldale, Ireby and Caldbeck. After 2 miles, turn right signposted Overwater 1 mile. Follow this road past Overwater itself then bear right at a road sign for Orthwaite The small car park (little more than a rough lay-by) is 100 yards on the left. Start: From the car park (NY 255354), turn left along the narrow road. At the road junction, turn left in the direction of Caldbeck (indicated by the road sign). Walk along the road for half a mile and lookout on the right for a finger post “Public Way Greenhead 1½ miles and Cumbria Way” (NY 266359). Go through the gate but instead of taking the direction of the fingerpost, turn sharp right and cross the stream to take the obvious broad track up the left hand side of the stream. Having started quite obviously, the path becomes a little indistinct but just keep following the line of the wall and it soon becomes clear again. After just over half a mile, the stream turns abruptly left to its source high on the fells but you carry straight on. Just over half a mile, you come to another stream (NY 275342) at the junction of two valleys, one to the left and the other straight ahead. Cross the stream and take the track up the valley straight ahead. 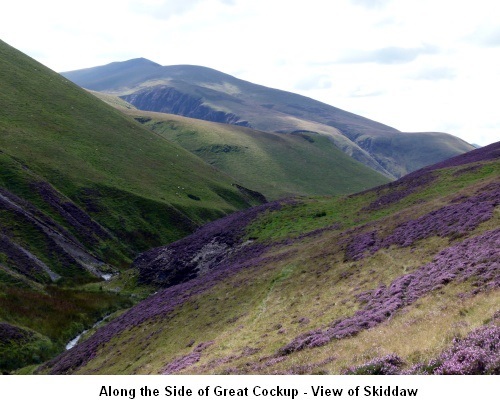 This ascent is shown with the unusual name Trusmadoor on the OS map and represents the only climb on the walk. As you climb Trusmadoor, behind you is a good view of the Solway Firth and the Scottish hills beyond. The path crosses a small and easily negotiated patch of scree and looking back you can just see the end of Over Water. The path levels out beneath another patch of scree and there is a stone cairn. Take the path to the right of this cairn. As you turn the corner (NY 295335), the mass of Skiddaw is ahead of you. 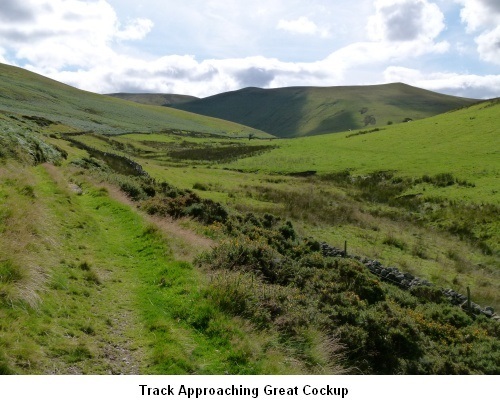 There is a steep path to the right to ascend the brilliantly named Great Cockup! However, our route continues along the hillside, following the line of the stream below. The path contours round the hillside and you will see Bassentwaite Lake ahead. The clarity of the path varies but if in doubt, just keep following the contour level around the hill until it reappears. You should soon see the broad grassy track ahead of you which you are going to join, turning right. At a fork, go left and at a crossroad of paths, go straight ahead. You come to a small rocky hill (Brockle Crag), a good vantage point and the path turns right just before this and descends to the broad gravel farm track below (at a finger post pointing back the way you have come for Burn Tod 2 miles). Turn right when you get to it. Follow the gravel track along passing a small defunct quarry on the right. At the road (NY 253337), turn right and walk along the road until you reach the white painted Orthwaite Farm. Just past this and before the next farm, turn left over the stile (NY 253341) in the direction of the fingerpost for Over Water Cottages 1¼ miles. Just before the trees and a metal gate, take the right fork. Go over a stile and follow the footpath diagonally across this field to the far corner. Cross a stile and two plank bridge across the stream and turn left. 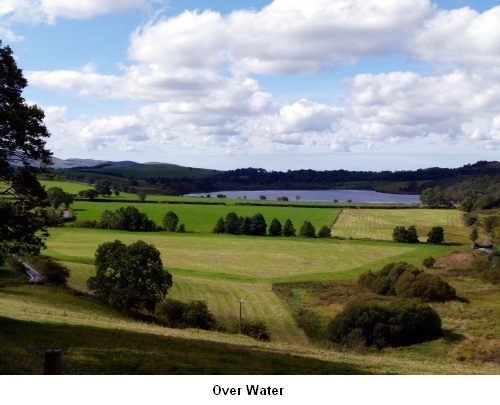 You will see some straight mounds on the right which are the remains of the Moat shown on the OS map (NY 247344). This earthwork is larger than you first think and I inadvertently went diagonally across it but you should walk down the left hand side of the field and turn right round the furthest point of the earthworks. You head for the left hand side of the small isolated stand of trees which is at the furthest corner of the earthworks. Go through the double gates and straight ahead, indicated by a yellow footpath arrow. 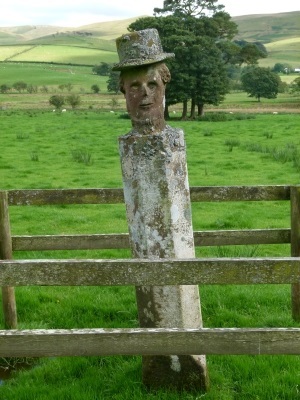 Follow the right hand boundary and as you get towards the end of the field, look out for the unusual statue in a small fenced enclosure (NY 244346) – if anyone knows what this represents, please advise. At the end of the field, go through the gate into the lane and turn left. On reaching the tarmac drive to the Overwater Hotel, by an old mill dam sluce gate, turn right. At the junction with the road (NY 243350), turn right and walk along the road, past Over Water, until you reach a right turn which is the location of the car park.